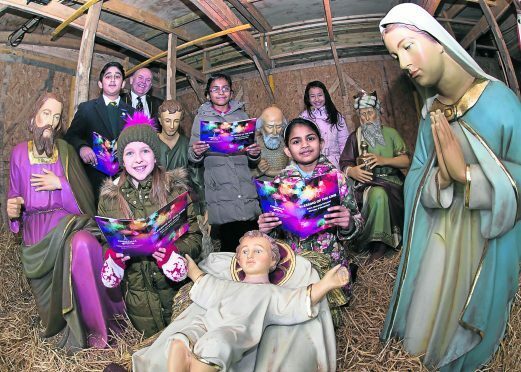 Pupils from primary schools across Aberdeen joined church leaders and councillors for the unveiling of the city’s nativity scene in the grounds of St Nicholas Kirk. The Very Rev Emsley Nimmo blessed the scene, which comprises of a life-sized Italian-made Mary and Joseph, baby Jesus, three wise men and two shepherds. Pupils from Hanover Street Primary, Holy Family RC School, Robert Gordon’s College Junion School, St Joseph’s RC School and St Peter’s RC School then sang carols. The scene, which is on display in a specially-constructed shed in the kirkyard – visible from Union Street – will be open daily until January 5.